Close your eyes. Take deep breathes, in through your nose and out through your mouth. With each intake of breath feel yourself fill with warmth and joy, and with outtake you feel yourself relaxing. (13 breaths) you are at your ritual level. Continue to breathe in and out, in and out (after 12) you are at your meditative state. You find yourself in a cottage in the woods, and you have just finished decorating your yule tree. As it is winter you now wish to take dried fruit and seeds out to the birds and animals that live in the surrounding forest. You put on your warm wool cloak that your mother had made you the winter before and gather your gloves and basket full of goodies for the forest critters. You follow the path from your cottage to the forest and can hear your steps crunch underfoot. Looking up to the forest before you, you see not the lush forest from winter, but barren trees with scattered evergreens. As you walking into the forest still following the path, you can hear the birds twittering as the day is clear and crisp. A good day for the animals to forage. Off in the distance you can hear smaller creatures moving around, looking for food. You have a special place to leave your gifts and continue to walk for a time and very faintly you can hear some moving water. You reach a small clearing to your right. Next to the clearing is a stream that has all but frozen over. Beside the stream is a small tree which is very bare and the perfect place to leave seeds, nuts, popcorn and cranberry strands as well as dried fruit. You decorate the ground and tree with your offerings and say a little prayer for the animals. Just off to the right of the tree is another path that leads to a very special place for you. You follow the path, your arms now light as the basket only olds one item now. You can see your destination ahead; a Holly Tree that has grown against an Oak tree. Your Grandmother has told you stories that twice a year, on this very spot the Oak King and Holly King, the forces of summer and winter, battle for supremacy over the Land. The Oak King, lord of spring and summer, presides over light and warmth. While the Oak King rules, the land is fertile, the days are long, and the winds are clement. The Holly King, lord of autumn and winter, has the power of darkness and cold. His winds are brisk and bracing. The fields are barren under his watch. You smile and shake your head. You have tried to catch a glimpse of this duel but alas is but a faerie tale. You start to move forward so that you can leave your annual offering at the trees base… suddenly you hear a noise, not one that you recognize. You stop short and hide behind a nearby tree so that you can peek around and see if it is safe to proceed. Up ahead two men approach from opposite directions. I am the lord of winter. See my works and rejoice! The night sky is dark and beautiful. The sun is not so bright as to scorch your skin or burn your eyes. The winter snow is white and beautiful. My evergreen trees stand tall and proud. There is no incessant buzzing of insects on my watch. Everything is quiet, pristine, and pure. All is as it should be. May winter last forever! No, my brother! It is time for your reign to end. Yes, the long nights are pretty, but now the sun must return. The blue sky of summer is just as beautiful as the starry sky of midwinter. The pines are beautiful, but so are the apple, maple, and oak trees. Snow is a wonder to behold, but so are flowers. Insects may buzz, but they also bring life to flowers and fruit trees. You reign must end. Spring must come! You smile, the Goddess has blessed you with the sight to see the changing of the season. The Holly King speaks: My brother, if you seek to rule the land, then you must take it from me by force. Let us be joined in battle. You look to the Oak King for his retort: Yes, my brother. Spring must arrive, and so I will do as I must. Let us do Battle! The two kings begin. At first, they are evenly matched, but the Holly King briefly appears to be winning. See! I hold the power of night, the power of winter. Yield to me, and I will spare you! Never! I must bring back the power of the sun. I will not yield! The Oak King’s combat prowess increases and the Holly King starts slowly retreating under the Oak King’s relentless blows. The Holly King shouts: No! Winter must continue! The Oak King shouts back: There must be balance, my brother! The Holly King is now obviously running out of energy. Under the barrage of blows, he drops to one knee, and then collapses to a heap on the ground. The Oak King stops swinging his weapon and holds his sword at the ready position, aimed at the fallen Holly King. The Holly King speaks: I yield. I am defeated. But I ask of you, my brother, that you spare me. The Oak King extends a hand to the Holly King and raises him to his feet. Oak King: Of course I shall spare you, my brother. You are need just as much as I am. The land must have balance between light and dark, warm and cold, waking and sleeping. Take your rest now. And we shall meet again at midsummer. 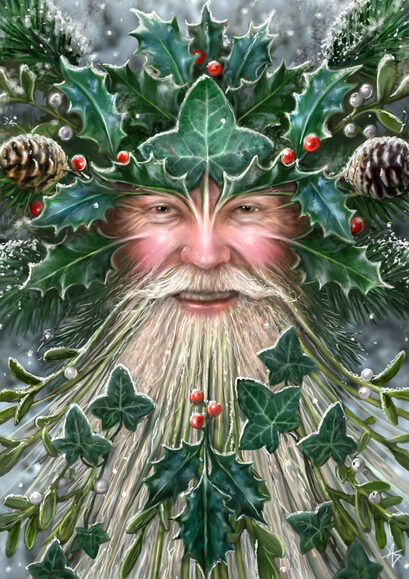 The Holly King bows respectfully to the Oak King speaks out into the forest “Let the light return. Let the days grow longer. May life return to the land.“ and both Brothers leave whence they came. You are so excited, the balance of power shifts from darkness to light, and you have now witnessed one of the great battles. From now until midsummer, the days shall increase and the skies will brighten. All is as it should be. Your rush forward and leave your offering at the base of the tree also offering the Goddess a prayer for allowing you to witness such a rite. You turn now as you wish to hurry home and share what you have witnessed with your sisters. As you walk down the path you become aware of your breathing, in and out. Continue your breathing as the scene before you begins to fade. Breathe in and out, in and out and as you breathe become aware of your physical body sitting on the floor (12 breathes). Continue to breathe in and out and start to become aware of your surroundings. Wiggle your fingers and toes. Stretch and open your eyes.